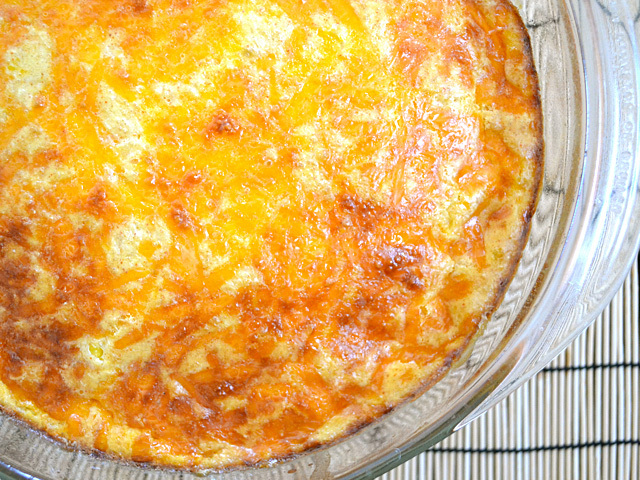 This Corn and Cheddar Pudding is a little indulgent with the cream, cheese, and eggs… but every now and then I think you’re allowed. It’s all about moderation, right? Right. 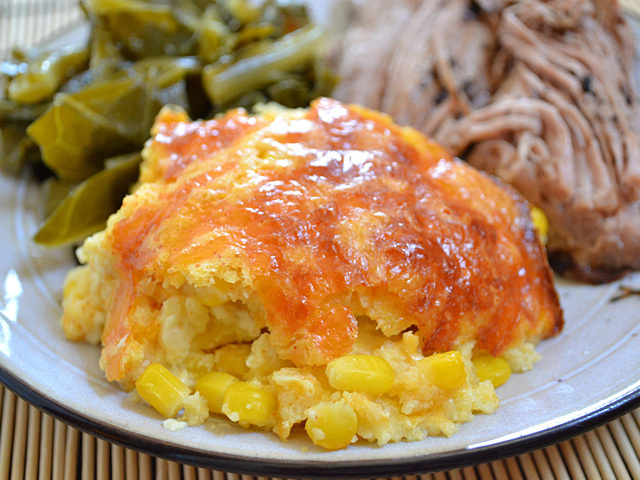 Corn pudding is another one of those recipes that can go so many different ways. Originally, I wanted to use poblano peppers (my fav) but my local grocery was out. So, instead, I decided to go the honey and cayenne route. It’s a little sweet, a little spicy, very rich, and definitely delicious. If you’re not all about the spicy stuff, leave out the cayenne and you’ll still have a nice contrast between the sweet honey and salty cheddar. You can also try dicing up some regular green and red bell peppers for extra color. There are many possibilities! 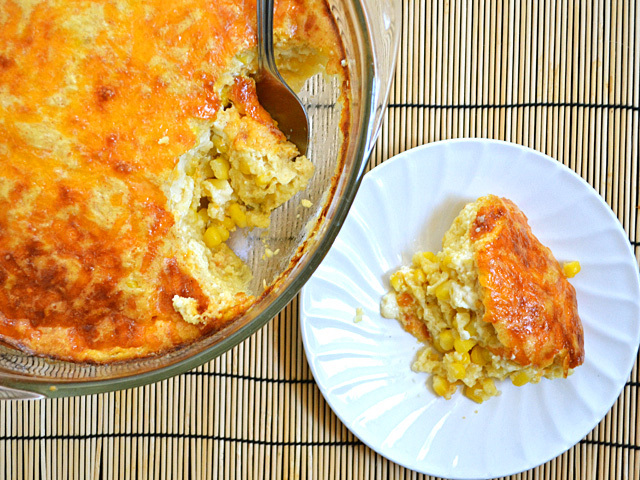 Rich and cheesy, this Corn and Cheddar Pudding is a truly indulgent side dish. Perfect with roasted or slow cooked meat. Preheat the oven to 350 degrees. Allow the corn to thaw (this is very important). 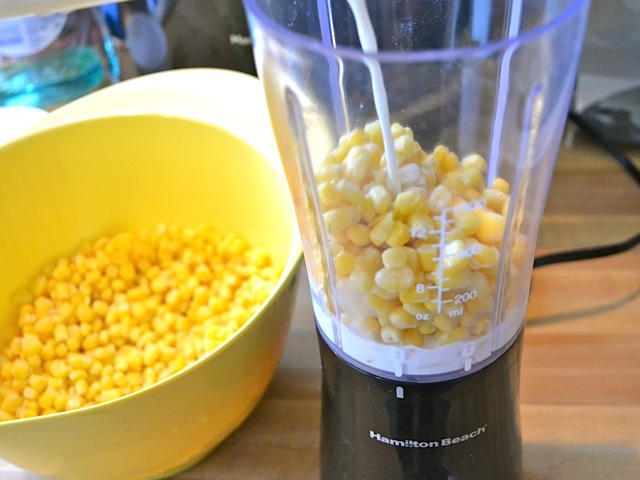 Place the milk and half of the corn into a blender or food processor and puree. 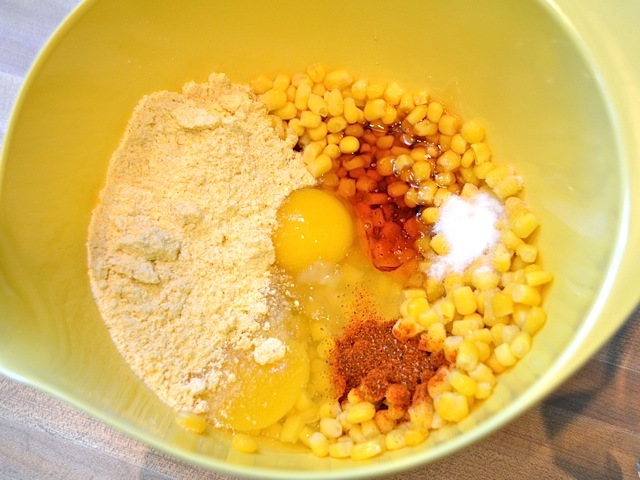 In a large bowl, whisk together the corn/milk mixture, half & half, eggs, cornmeal, honey, cayenne, salt, and the rest of the corn kernels. Make sure to whisk really well so that the egg is fully incorporated or else you’ll end up with chunks of baked egg in your pudding. If your corn is still frozen, the honey will not dissolve so make sure the corn is no longer cold. 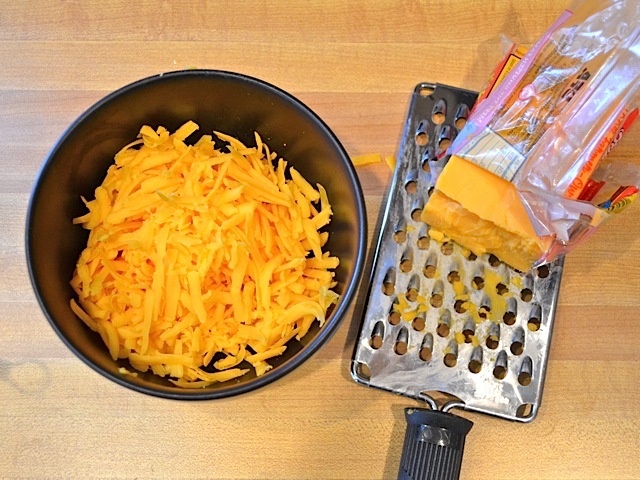 Shred 4 ounces of cheddar cheese. Stir half of it into the corn pudding mixture. Coat a 8×8 (or similar size) baking dish with non-stick spray and pour in the pudding. Sprinkle the rest of the cheese on top. Bake in the preheated oven for about one hour or until the center of the pudding shakes like a bowl full of jelly. Check the pudding at about 50 minutes by shaking the dish slightly. If the center wiggles like a liquid, let it cook just a little bit longer. Allow the pudding to rest for about five minutes after baking. Serve warm! Allow the corn to completely thaw. Puree half of the corn with the milk. Preheat the oven to 350 degrees. Whisk together all of the ingredients except the cheddar. 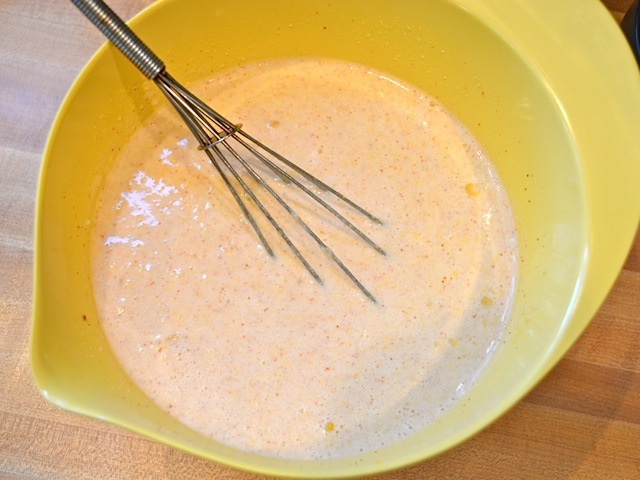 It is probably easiest to whisk together the pureed mixture, eggs, cornmeal, honey, cayenne, and salt first, and then add the whole corn last. Make sure to whisk well so that the egg is well incorporated or else you’ll have pockets of baked egg in the final product. Shred 4 ounces of cheese (half of a regular sized block). Stir half of that into the corn pudding mixture. 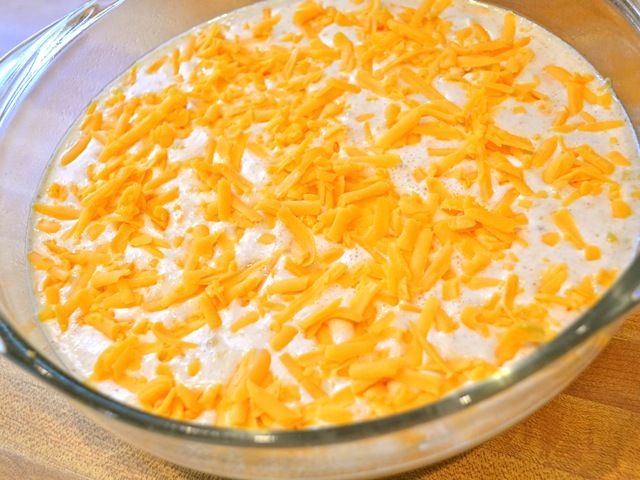 Pour the batter into a baking dish coated with nonstick spray and sprinkle the rest of the cheese on top. Bake in the preheated 350 degree oven for about an hour or until the center of the pudding barely wiggles when you shake the dish. If it wiggles and waves like a thick liquid, let it bake longer. I usually check the it at 50 minutes just to be sure. Every oven is different! Let the pudding rest for about 5 minutes before serving. 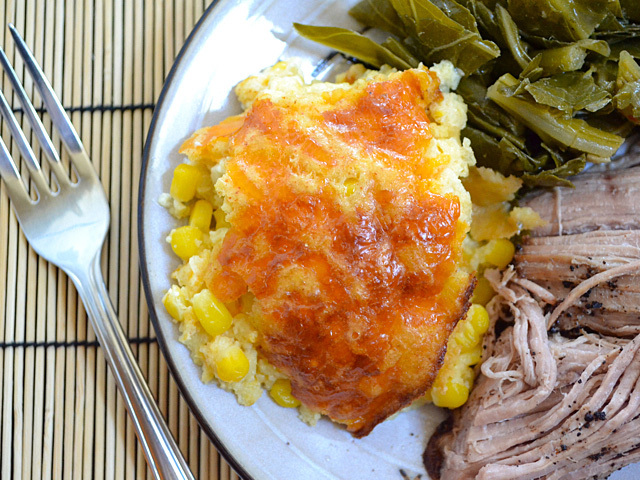 I’m not sure, I’ve never tried a recipe like this in a slow cooker. I made this last night as part of a vegetarian dinner with roasted fingerling potatoes and a garden salad and it came out perfectly. I was skeptical of it going in b/c it was so liquidy but it turned out just like the picture! I followed the instructions exactly. Next time I might add a can of drained green chilies or a chopped and seeded jalapeno. I will definitely make this again! Hi Beth, no worries about the comment, I realize this is a busy time of year. And thanks for the tip about the milk, I ended up making a big dish of this (doubled the recipe!) for Friendsgiving and it was a big hit! 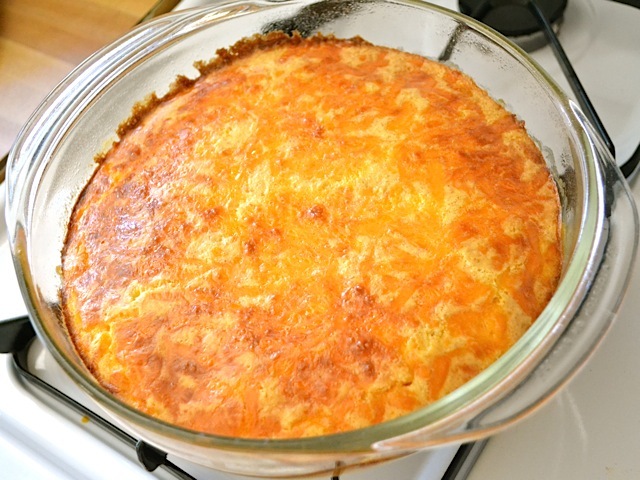 One of my friends said it was a little more like a quiche than a pudding; I didn’t really know the difference, but they liked it just the same. Definitely putting this one in the success list. I’m so glad it turned out well!! Happy holidays! Hi Taylor, if you’ve left a comment before then all your comments after that will be automatically approved. :) I just hadn’t gotten to reading through the comments for the past couple of days yet. Sorry about that! I really think whole milk works best for this recipe because you need the fat in there to make the custard-like texture of the pudding. I think almond milk would be too watery.